We all know you need a thick skin to make it in the music industry. Jordanian singer-songwriter Emad Alaeddin must have a hide like a rhino. He spent the best part of a decade in Los Angeles trying to become a rock star as lead singer of heavy rock band Avowed. He didn’t succeed. And he tried hard. He admits he’d pretty much given up on his music career at that point, beginning work at the new internet provider his family had set up. However, within a few months, having started doing a few acoustic club gigs, he discovered that people actually liked him. Fast-forward to the present and Alaeddin has had a video (the hooky acoustic pop track “Sunshine”) on heavy rotation on MTV Arabia, released his first solo album (Centered, on which he played most of the instruments, except for the drums) and played several gigs in Europe, with dates in London, Frankfurt and Spain lined up for next month, including a gig in a castle. “It’s been insane,” he admits. “I got into the European circle through my college buddy Jason Manns. He’s a singer-songwriter, same style of music as me. His voice is just heaven-sent. We sang in the same a capella group in college. I moved to L.A. a year before he did, so I’d kind of established myself. He moved into the same place I was living. We heard about this online Idol-style competition and I kept telling him to enter. He didn’t want to, so I just videoed him one day playing guitar on the sofa and sent it in. He comes in second place. He’s been there three weeks and he’s already got L.A. buzzing. He gets to go to Vegas and play, and he met Ryan Seacrest and this guy Jensen Ackles, who’s one of the leads in Supernatural. They became good friends and Jason starts playing the Supernatural conventions and builds up a huge fanbase. Being a solo artist suits him, Alaeddin says. “I don’t mind bands, they’re fun and they’re cool and everything, but I always enjoy it 10 times more when I’m playing by myself. I feel like I connect much better with the crowd.” And, judging from the feedback, it’s been a smart move going out on his own. Not that Alaeddin’s getting too carried away. forty-seventh party to a secret location. brighter with every calculated step of dedicated work he takes. them weekly as they tune in. So what does a man with all this growing buzz do next? album; tell us how this decision affected your career. While performing Avowed songs in Amman, I met Ruba M.
Abu Laban who is a proven figure in the local music industry. unreleased tracks that she signed on as my manager full-time. accomplishments and success I’d never experienced before. you’ll be where you are today? interacting with my fans than I am actually performing. UM: A lot of the songs you write are autobiographical. all are fragile and afraid to face this challenging world alone. emotions of love, turmoil and the in-between. sound from your debut release Centered? extensive touring and radio appearances. are you going to experiment something new? prominent singer to add a different flavor to the mix. any recent and upcoming releases? night that will determine his/her success. talent, had it be their vocals, or instrument. musical instruments and school supplies. what more should we expect from Emad Alaeddin in 2011? music,” I’ve used both statements as a tool to strive to succeed. exposing your self-titled Avowed album? and financial success you'll be chasing an ever-escaping carrot. are memorable. So from a musical standpoint it was a success. the day, it's the same voice singing with the same emotions. album not live up to its expectations. out there and working by yourself? band because they just didn't match the style of the band. to purchase, hotel rooms to book, transportation, food, etc. which are cut astronomically when touring solo. to offer him/her a performance gig. Just one month after local pop rock talent Emad Alaeddin released his first music video, entitled Sunshine which was recorded around Jordan, MTV Arabia has taken the homegrown production up and is now airing it on high rotation with other international hits. Sunshine, along with other songs which are featured on Alaeddin’s living room-recorded debut solo album Centered, isn’t the hard soul rock sound of Emad’s LA band Avowed, which he brought to Jordan to showcase in 2009. But according to the rising star, his new sound has been around for a while, it’s just newly heard. Jordanian singer/songwriter Emad Alaeddin's album entitled 'Centered' was launched on Nokia's Ovi Music Store, making him the first and only Jordanian artist featured in the store. 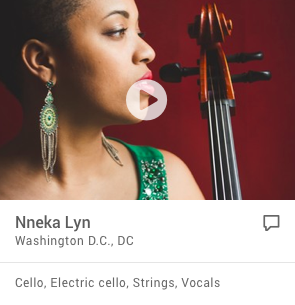 Nokia will also be including Alaeddin on the store's front page as the featured artist. Alaeddin stated, "Nokia offers customers unlimited access to millions of tracks from the Ovi Music Store, and being the only Jordanian singer and songwriter amid a list of renowned artists will help launch my career from a local level to a regional one, which is a huge milestone for me in such a short period of time." 'Centered' was made possible by KULACOM Jordan as part of its 'Local Company, Local Talent' initiative that aims to support and promote Jordanian talent. The album is available for download from Nokia's Ovi Store and can be purchased at Virgin Megastores. He added, "The album focuses on a more sensitive and transparent style of songwriting and lyricism to give my fans a better idea of who I am as a person and musician." Jordanian singer/songwriter Emad Alaeddin's first music video entitled 'Sunshine' will be on high rotation on MTV Arabia as of September 10th, 2010, making him the first independent artist to be part of the hip music television channel. 'Sunshine' will be broadcasted throughout the Middle East region reaching millions of viewers. Alaeddin stated, "To finally earn a place in the music industry with the most respected music channel after a decade-long pursuit of a dream is such a great feeling of relief. Now I don't have that feeling like I have the time monster chasing after me anymore and can do what I've always wanted to do. Write, record, perform, and tour for my fans throughout the region and the world." Alaeddin's solo album 'Centered' and 'Sunshine' music video were made possible by KULACOM as part of its 'Local Company, Local Talent' initiative that aims to support and promote Jordanian talent. 'Centered' is available on iTunes, the Ovi Store, and Virgin Megastores. Emad Alaeddin, lead singer of Avowed (and sometime JO poster-boy) is currently putting the finishing touches on Centered, a new 14-track album set to be released on February 14. The solo record, sponsored by the Jordanian Internet service provider Kulacom, collects a decade’s worth of songs that Alaeddin says he’d written but never recorded. The new disc sports a very different sound and sensibility than Alaeddin’s previous work. The few tracks we’ve heard so far alternate between the Jack Johnson-esque upbeat pop of “Sunshine” and a more somber, confessional ballad style that seems influenced by ‘90s indie-rock. Kulacom is pressing the albums and selling them exclusively at their outlets in Mecca Mall, SmartBuy, and the MABCO showroom at 8th Circle. Centered will also be available online at iTunes and Urfilez. ratcheting up the buzz for the arrival of his best mates. near Roman ruins of any kind,” laughed bass player Nick LeRoux, “playing there is simply something I’ll never forget. apparently a little more than your taxi drivers can handle! the face of a lion and that he ‘looked like he ate people’! and you have a genuine cultural exchange going on. Kulacom Series concert at Souq Jara was the clear highlight. re-apply them so no one knows any better! Contrast, or at least incongruity, is something that seems to have defined Emad’s life to date: growing up with one radio station in 1980s Jordan and now playing concerts to tens of thousands of Americans over the internet; growing up with George Michael, maturing with the complex harmonies of Alice in Chains; studying economics in Virginia, moving to Los Angeles to become a musician the second he graduated; loving the anonymity of California, missing the certainties and cultural understanding of home. He even doubles his time as a rock’n’roll frontman with a job at a Los Angeles branch of Citibank. Perhaps the biggest contrast of all, though, was at the very genesis of Avowed, when he was trying to find a guitarist for his rock band in the aftermath of September 11th. “Back in college, everyone was very interested in the whole Arab thing, and wanted to know more about it,” he says, now walking past graffiti proclaiming the merits of Jordan’s leading football club, Al Faisaly. “When I moved to LA in the summer of 2001, it was the same, with people calling up and asking where my name was from and saying, ‘Oh he’s Arab, that’s cool, that could be interesting…’ Literally a month later, September 11 happened, and it all changed. Conversely, in Amman, the packs of pre-teen kids who are now staring at the curly-haired, goatee-bearded 30-year-old as we try to find somewhere for a cliché-free-but-still-locally-relevant portrait, have no idea he is even from this planet, never mind from these very streets. His other-worldly appearance, filling up an iron gate or overlooking the stone-coloured folds of Downtown Amman, merits an avalanche of hellos in English, and even his Jordan-accented Arabic responses merely prompt a renewed flurry of TV English. He immediately expresses reservations about his forthcoming interview on the Arabic radio station Sawt al-Ghad. Avowed, though, is more than a vehicle for an Arab voice in America. The Arab element – via Emad, lead singer, rhythm guitarist and principal songwriter – is real, but it’s no gimmick; there are three other musicians in this for their own rock’n’roll reasons – and none of them involve Umm Kulthoum. Co-songwriter and lead guitarist is Jesse DeSanto, with Erik Kreft on drums and percussion and Nick LeRoux on the bass. All recruited from the LA music scene, they come with their own influences and ambitions. It’s Emad and Jesse’s relationship that is pivotal in providing the Avowed sound. In the early days, the band was known as Third Wish, and they released three albums that they were far from satisfied with. Only since they changed their name to Avowed, and recruited Bullets and Octane bassist Brent Clawson to produce their album (he’s also worked with The Knives), have they a sound and an approach that they can call their own. “There’s always a tug of war between me and Jesse, but it’s free from egos,” Emad says. “We respect each other’s talents and ideas, and it’s all to search for this middle point that is Avowed. WHEN JORDANIAN EMAD ALAEDDIN, lead singer of the California-based band Avowed, came to Jordan in February of this year to promote their eponymous debut album, released in August 2008, there wasn’t much of a local alternative rock scene to introduce it to. But after a run of live performances and local radio sweeps, the Avowed name and sound have left a lasting and sung-along impression on Amman’s insatiable rock fans. There are no tidy comparisons between Avowed’s orginal sound and that of other bands, but their influences can be traced to Alice in Chains, Porcupine Tree and, as Alaeddin himself admits, Michael Jackson. Much of the album focuses on relationships, from beautiful beginnings and endings, to lessons learned, as in the songs “You and I,” “Really Over” and “How Does it Feel?” Meanwhile, tracks like “Save the Angels” and “Living a Lie” propose a deeper, yet easily appreciated outlook on the political and humanitarian turmoil in Palestine. The ten-track album flows together well and allows listeners to enjoy excellent mastering of a unique ensemble of strings and drums, along with a soulful, gnarly elongation of the sung word. Avowed will be playing live at Souq Jara on July 31. Wireless internet service provider Kulacom has provided sponsorship to fly the band to Jordan through its initiative “Local Company, Local Talent,” whereby it aims to supports Jordan’s growing talent base. Proceeds from the sale of Avowed merchandise, CDs and tickets will be donated directly to the Palestine Legal Aid Fund. WORKING IN MUSIC IN the Arab world usually means singing the same song everyone else is singing and making a cheesy music video to go along with it—after the plastic surgeries. If you’re in the hip hop scene, it’s a dead end act you do just to pass time while your shawerma is being prepared. But if you are Emad Alaeddin, 29, the songwriter and lead vocalist for the band Avowed, you just don’t care. All that matters is that you’re doing what you love. 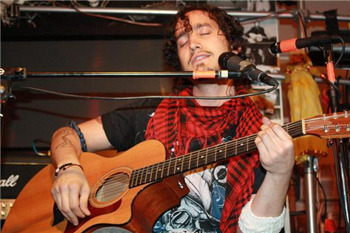 Alaeddin came back to Jordan shortly after Avowed released their eponymous debut album in August. Within the first week of his arrival, English radio stations like Beat FM, Play and Spin were playing “Save The Angels” and other Avowed tracks, and, according to band members, Virgin Megastore had picked up the album for distribution throughout the Middle East. Avowed's distinctive West Coast hard rock sound blends grunge and alternative influences with soul-inspired vocals. And though it boasts clear similarities to Seattle-based soul rock bands like Maktub or Indigenous, Avowed comes with a definite LA edginess. Though it was only formed last February, Avowed is already making its name known in the cutthroat music market of L.A.
Their album is deliberately independent of lofty music labels, but Avowed have made good use of the web, with official pages on MySpace, iLike, iTunes and other networking sites. “Since the release of the album in August 2008, “How Does It Feel?” was awarded Winning Song for the month of August by songoftheyear.com,” Alaeddin adds. And the band is preparing for an upcoming UK tour. Easily done, says Alaeddin—next stop, Amman. With their talent, charisma, tattoos and songs, it looks like Avowed just might have what it takes to penetrate local musical interests and give insight to struggling artists. JO seized the chance to find out exactly what made this Arab’s musical venture work. WHERE DO YOU COME FROM, AND HOW DID YOU GET INTO MUSIC? I was born in Amman, Jordan. I got into music from when I was a baby: as soon as I was able to speak, I was singing. When I left Jordan for college, I had it in my mind to still do music, despite getting a degree in something completely different. This was based on my mother's advice, who used to love music so much until she studied it in school where they force it down your throat and turn you against that craft. And that's the last thing I wanted. As soon as I graduated, I moved to Los Angeles to find and create my band. Why Los Angeles? Because it was the most competitive market and I knew that throwing myself into such a cutthroat environment like the L.A. music scene would prepare me for the rest of my musical journey. 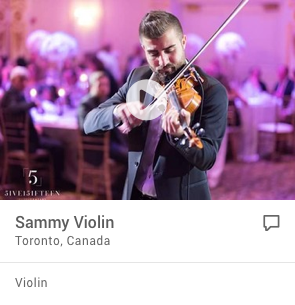 WHAT’S THE DIFFERENCE BETWEEN PERFORMING IN THE US AND IN JORDAN? When we finished the album, I first wondered how our music would be received by Amman and the rest of the region. This was because there never has been an Arab doing this kind of rock. Completely uncharted territory. When I returned to Amman to visit my family and promote the release of the album, I was shocked at how well the album was received, by both rock fans and non-rock fans. The radio stations were so supportive and the listeners were so happy with the music that requests for the songs were an everyday occurrence. I decided to perform a small acoustic show at Canvas, where I'd play the album along with other songs and covers. In response to what the listeners heard on the radio, the venue sold out and the show lasted 2.5 hours. And it hit me: I'm an Arab, I'm a proud Arab, and it only feels right to have Avowed's success first start from my home, the Arab World. I discussed it with the guys to focus our efforts on my home country Jordan, and they are as excited as I am to make this a band that emerges from Jordan. There is an eager music scene in Jordan; they are so supportive of their local talent and I strongly believe that the opportunities are there to become a successful music act. WHAT IS THE SECRET INGREDIENT THAT SUCCESSFUL BANDS HAVE THAT OTHERS DON'T? Avowed has accomplished a lot in the few months that it has been around, but are we a success? Distribution with Virgin, and the countless messages we receive from our adoring fans seems to indicate that we are headed in the right direction. We've received messages from fans who say our music has got them through such tough times as bitter breakups, health problems, and even war. I think we have the right ingredients for success: a great album, a killer live show and, most importantly, amazing and loyal fans. We decided to go with supportive private investors rather than reach out to labels for the recording of the album. This was because we knew what we wanted and we feared influence from a large corporation. It was a blessing that we were able to control our creative direction with our album, and got Brent Clawson, the producer and bassist for [the band] Bullets and Octane, on board to produce the album. WHERE DO YOU GET YOUR SONG IDEAS FROM? I write a lot about past relationships, from the aspect of the great times and the times when it fails and ends. “How Does It Feel?” and “Make It Right” are songs talking about a bitter breakup, where “Livin' a Lie” is about acting like a friend to the one that you love because you know that showing your true feelings would end the relationship entirely. “Save the Angels” is a Romeo and Juliet type of love story, where a boy and girl from combating backgrounds fall in love. “More Than You Know” is about a would-be terrorist who changes his inner self by way of love. I also write a lot about my Arabic culture. I've recently written a song called “Arabic Girl” that's about landing in this beautiful country and falling in love with an Arabic beauty. I wrote it during my fateful trip last month when I decide to move back to Amman to promote the album there. I recorded it on my last day there and it's since been mixed and will be released on the airwaves in February. I also write about the strife of the Palestinian people. My song “Palestine” begs that Palestine should be free. Avowed's been rehearsing these songs and plans to include them in the next Avowed album, which is due by the end of this year. Because of the success we had in December while promoting the album in Amman, I will be relocating to Amman promoting the album through radio appearances and acoustic performances. The rest of the band will be able to continue their lives in Los Angeles and will be flown out every four or five months to play the big show. I will be flying back to Los Angeles every few months to perform shows there as well. 2008 - "Save the Angels and How Does It Feel?" on Play 99.6, EnergyFM, BeatFM, and Spin Jordan. 2009 - "Arabic Girl" on Play 99.6, EnergyFM, BeatFM, and Spin Jordan. 2010 - "Sunshine", "I Will Wait", "Lady", "Runaway", "Centered" on Play 99.6, EnergyFM, BeatFM, and Spin Jordan. 2011 - "Don't Leave Me Here"
While in Los Angeles, Emad trained with acclaimed vocal coach Ron Anderson and was the only Arab to have been nominated for Best Male Vocals in the Los Angeles Music Awards in 2007. He's also a two-time award-winning songwriter on songoftheyear.com for his songs "More Than You Know" in '07 and "How Does It Feel?" in '08. After spending almost a decade in Los Angeles playing in his rock band and learning the craft of vocals and songwriting, he finally felt ready to return home and launch his career from Jordan in 2009. Ever since his return to Jordan; Emad’s debut solo album "Centered" was released became the first and only Jordanian to be a featured artist in Nokia's Ovi Music Store, where exposure to his album reached millions of subscribers. His single "Sunshine" blew up the radio waves and was in heavy rotation on MTV Arabia. It also received a very good review from ‘Rolling Stone’ Magazine. In 2009, Emad was featured on the cover of Jordan's OC Magazine and has also been featured in both JO Magazine and NOX Magazine numerous times. He’s made radio performances to the English stations such as BeatFM, PlayFM, Spin, Energy, in addition to the Arabic stations such as Sawt El-Ghad and Sawt Amman. Emad has also performed at several cities around the world, cities such as Amman (Jordan), Manama (Bahrain), Damascus (Syria), Dubai (United Arab Emirates), Los Angeles (USA), Beijing (China), Frankfurt – Berlin – Cologne (Germany), Santander (Spain), and London (England). In more than a decade, Emad Alaeddin has become a symbol and an idol that represents Jordan in International countries. 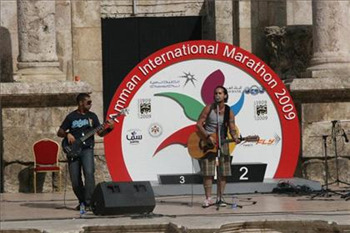 In November, 2010 Emad started a charity called ‘Bring Change’; a charity that donates money raised by attendees of the ‘Bring Change’ concert series as well as both used and brand new musical instruments to schools and after school music programs at public schools and universities across the World. In March 2011, Emad released a 4-track EP entitled "Don't Leave Me Here". A favorable review from Rolling Stone that commended Emad's vocals and new electric sound sparked an urge by Alaeddin to start recording his follow up sophomore album. After spending the summer of 2011 recording in his home studio, Emad Alaeddin has emerged with a new album entitled "The Magic" which masterfully joined rocking electric guitars with soulful vocal melodies and lyrics. In preparation for the new album release, Alaeddin assembled a talented band of musicians and vocalists to bring "The Magic" to life on stage.? Sure don't wanna fight it. And it's an innocent and strange love. but forever? Wait and see. At life right through her eyes? I let myself right in as I'd always done. His girl is leaving town for good. I picked myself up, I’m ready to keep on. I’m not the best son you’ve ever had. All I wanted in this world is to make you proud. It may seem I’d fallen where the others had trodden. But wait, this race is nowhere near over yet. Cause each time I fall I’ll grow a little wiser. And wary of the dangers laid on my road. It still shines bright inside.